Secretary of State Hilary Clinton explains to the House of Representatives Foreign Affairs Committee that the Obama Administration needed to spend 13 months trying to engage Iran's dictatorship because that's helped its effort to line up world support for new sanctions against Tehran over its nuclear program. Let me get this straight. Russia and China still oppose sanctions. Some European countries and European Union leaders are holding up approval of sanctions. So I challenge Hilary Clinton: Name one country which opposed sanctions a year ago but now has become an energetic supporter because the United States spent a year giving Iran every chance to make a deal. Name one. It is possible oppositionists privately flattered the administration by such statements but every public statement I’ve seen says the opposite. It is not exactly a secret that the administration refused to condemn the Iranian regime at the critical moment just after the stolen election, when the opposition's chances of building momentum were best. And here, too, in Clinton's formulation, is the implication that popularity proves that a strategy is correct, a fundamental mantra of this administration. In fact, although it is only gradually starting to seep out in the media, many U.S. allies and supporters abroad are horrified by what's happening (as shown by dozens of articles on this blog). We all know the famous Santayana quote, "Those who cannot remember the past, are condemned to repeat it." But why is it that we are so forgetful that we cannot remember the past, and thus must keep repeating it, over and over again? Human self-centeredness convinces us of our own specialness and uniqueness, and all too easily fosters the historically fallacious idea that we are living in a unique time and a special age. That we have left behind history with our progress and our achievements, and with our very existence. That we exist now apart from the great roll of human history. And as soon as we become convinced of this idea, the past comes sneaking up on us, dooming us to repeat it. That is why it is so very dangerous to forget history, to sacrifice the past to our own egotism, to convince ourselves that it doesn't matter anymore. And that is why so many of the Jewish holidays are historical holidays. To observe the Jewish calendar, is to immerse oneself in Jewish history. Its holidays do not simply link the present to the past, they incorporate the past into the present, making them into one great whole. In the winter, we rise up against an empire and fight for our freedom. In the early spring we are sentenced to death and fight for our lives in the streets of the Persian Empire. We build pyramids for a Pharaoh, feel the lash on our skin and are led out through the Red Sea by the hand of G-d. In the summer our temples fall and we are led into exile. In the fall, we wait out the desert heat of the Exodus in booths as we prepare for our new life. We cannot let go of history, because we are history. It is the history we have carried with us in our calendar, for our holidays and our history are one. To observe Purim now and hear the Megillah read, is to bear witness to a planned Holocaust that is aborted at the last minute. Someone who comes to sit and hear the Wannsee Conference take place in Persia, 2500 years ago, understands that the Holocaust was not a new development, but a very old one. That is what too many Jews failed to understand in 1939. It is what too many Jews fail to understand in 2010. Because history has never ended. History never ends until it is done. There is something pathetic about what passes as European foreign policy these days. Quite simply, more often than not, the concerted positions of the EU member nations have nothing to do with any of their national interests. Take the EU's initial response to the killing of Hamas terror-master Mahmoud al-Mabhouh in Dubai on January 19. A senior terrorist engaging in the illegal purchase of illicit arms from Iran for Hamas-controlled Gaza is killed in his hotel room. The same Dubai authorities who had no problem with hosting a wanted international terrorist worked themselves into a frenzy condemning his killing. And of course, despite the fact that any number of governments, (Egypt and Jordan come to mind), and rival terrorist organizations, (Fatah, anyone?) had ample reason to wish to see Mabhouh dead, Dubai's police chief Lt.-Gen. Dahi Khalfan Tamim blamed Israel. Relying only on Tamim's allegations, EU leaders went into high dudgeon. Ignoring the nature of the operation, the basic lack of credibility of the source of information, and the interests of Europe in defeating jihadist terrorism in the Middle East and worldwide, the chanceries of Europe squawked indignantly and threatened to cut off intelligence cooperation with Israel. A ruling by the European Union’s highest court yesterday is a perfect example of the law of unintended consequences. The court ruled that the EU’s free trade agreement with Israel does not apply to the West Bank, and therefore, goods made by Israeli firms in the West Bank are subject to EU import taxes. Legally speaking, it’s hard to quarrel with the ruling: even Israeli law doesn’t view the West Bank as Israeli, as it does East Jerusalem and the Golan Heights. But for years, European countries ignored this detail and exempted Israeli firms in the territories from import duties. What has changed is not the law but the politics: seeking to persuade Israelis that “the occupation” doesn’t pay, EU countries recently began taxing such imports. A German importer then sued his country’s tax authorities, prompting yesterday’s verdict. Colonel Richard Kemp, a former British Army commander in Afghanistan, described on Monday what he regarded as the different responses in the international media to the military actions of British and Israeli forces. Speaking at an event in London, and quoted the next day by the BBC, Col Kemp argued that Israel faces greater and more instinctive criticism of its military operations than Britain does. Reports from Afghanistan this week make a good test case for Col Kemp’s assertion. 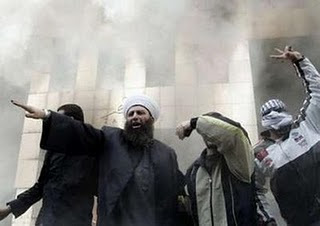 At least 27 civilians were killed in a NATO air strike in the Afghanistan province of Uruzgan on Sunday 21 February. Airborne units opened fire on what was believed to be a group of insurgents, but which was actually a travelling party of civilian ethnic Hazaras, prompting a personal apology from General Stanley McChrystal, Commander of NATO forces in Afghanistan. Separately, 12 civilians and three Taliban were killed in a strike in Marja as part of Operation Moshtarak – NATO’s latest offensive in neighboring Helmand province. He is not his father’s son. In a stunning revelation, the son of a Hamas founder told an Israeli newspaper this week that he once served as an Israeli intelligence agent. Mosab Hassan Yousef, 32, told the Israeli daily Haaretz that he spied for more than ten years on the Iranian-backed terrorist organization that has ruled the Gaza Strip since 2007. In his role as Israeli informant, Yousef is credited with helping arrest high-ranking terrorists. Much more important, however, is that he also saved the lives of “hundreds of innocent people” with the information he provided the Israeli intelligence service, Shin Bet, about pending suicide attacks. “So many people owe their lives to him and don’t even know it,” Yousef’s unidentified Shin Bet handler told Haaretz. Yousef’s Israeli handler went on to relate how the “Green Prince” – Yousef’s codename, taken from the color for Islam – personally picked out a suicide bomber in a Ramallah square and followed him until an arrest could be made. I never thought that my last military reserve duty (“Meluim” in Hebrew) would leave me nostalgic. Going to Meluim means dropping your family and work for up to one month every year and going back to your army unit. Typical tasks include doing guard duty in the middle of the night, shooting, helping in the kitchen, patrolling the border, and cleaning the restrooms. Then of course, there is this maddening “hurry-up and wait” pattern: You’re rushed out of bed at 5 am only to be told a few minutes later that something went wrong with the schedule and that new instructions will come –maybe, sometime during the day, nobody knows. Having just turned 39 and being in a combat unit, I no longer have to deal with this. “Good for you” you may say. Actually, what a loss. The IDF’s reserve duty system is a logistical nightmare for the army and a highly disruptive occurrence for people with a life. And yet, it is one of the best things Israel has ever invented. Meluim are socially and psychologically healthy. A commandant can be a 25 year-old student giving orders to a 39 year-old professor (who could incidentally be his teacher). A taxi driver can wake up the CEO of a multi-million dollar company at 3 in the morning to switch him on guard duty. J Street Silent on Israel Apartheid Week. Surprised? "Past IAW events have featured extreme anti-Israel rhetoric, including accusations of Israeli racism and apartheid; calls for boycott, divestment and sanctions campaigns against Israel and Israeli institutions; and allegations that Israel is committing war crimes and genocide against the Palestinian people. IAW events have taken place on college campus and at churches, community centers and elsewhere." The American Jewish Committee, CAMERA, The David Project, Stand with Us have all condemned the thinly-disguised Jew-hatred in the form of BDS advocacy (Boycott, Divestment and Sanctions). In its self-aggrandizing description, the group even refuses to identify Jerusalem by name - it is called Al Quds. A UK judge issued an arrest warrant for Queen Esther, who is due to arrive in London for a speaking tour of British universities. Tayab Ali, the solicitor who obtained the warrant, told Backspin editor Pesach Benson, "Mordechai and Esther had every right to resist the oppression of Haman's Amalekite regime, but Jewish defensive measures were disproportionate and war crimes did occur." A spokesman for Queen Esther condemned the warrant, and reiterated her refusal to meet with a UN commission investigating civil unrest after the collapse of Haman's center-right cabinet. Media reports, human rights groups, and Amalekite non-governmental organizations say 125,000 people -- mostly Amalekite civilians -- died in fights with the Jews. Jewish groups dispute this, putting the death toll at 75,000 -- all of whom were combatants. Happy Purim to all our readers. The Tel Aviv District Court handed down a ruling that Jewish families, who had won a public tender to purchase land in the Tel-Aviv suburb of Jaffa, are entitled to go forward with their plans to construct a multi-family building. The families' rights to build had been challenged in court by a coalition of Arab-Israelis and politically motivated NGOs. The coalition demanded that the families' bid be disqualified by the court based solely upon the fact that they are Jewish and that their presence in Jaffa will tip the demographic balance of the neighborhood and discriminates against Arabs. Several months ago, the families submitted a joint bid on a plot of land in Jaffa which had been offered up in a public auction by the Israel Lands Authority (ILA). The families planned to build a residential building, with twenty apartments, on the plot. A competing, lower bid was submitted by an Arab contractor. After considering all the bids, the ILA awarded the rights to the Jewish group. Following the families' victory, a coalition of twenty-five Israeli-Arabs from Jaffa, along with three Israeli human rights NGOs, filed a petition in the Tel Aviv District Court against the ILA, insisting that the families' successful bid be disqualified. The coalition argued that since the families intended to build apartments primarily for Jewish citizens, the ILA - a government agency - had somehow discriminated against the Arab contractor and Arab residents of Jaffa in conducting the public auction. The petitioners argued that the local Arab population of Jaffa suffers from a housing shortage and that the court should issue an injunction against building any apartments, unless the builders agree to allocate housing units specifically for Arabs! 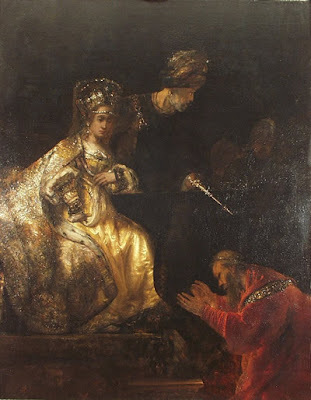 With the festival of Purim around the corner, Jews turn to Persia and tell the story of how the Jewess Esther and her uncle Mordechai saved their people from extermination by the wicked Haman. Same story, different time. 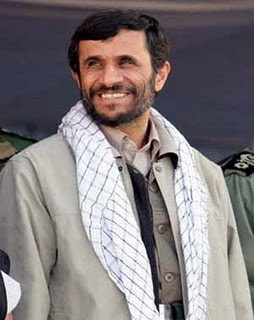 President Ahmadinejad has again just announced he is looking forward to a Middle East without Zionists. In leftwing circles it's become fashionable to downplay Ahmadinejad's threats to annihilate Israel as just so much empty rhetoric, or a mistranslation of the Farsi. We are now seeing a breed of young (Ashkenazi) Israeli academics who see Marxist dichotomies and hifalutin' theories of cultural dissonance where there is just plain old antisemitism. This book, by professor Haggai Ram, at Ben Gurion university, reviewed here, is no exception. Which part of the new "positive, constructive U.S.-Syrian relationship" involves having the US Secretary of State getting publicly mocked by grinning totalitarian thugs? 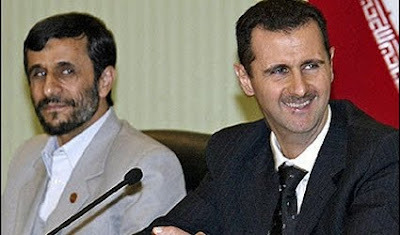 President Bashar al-Assad and his Iranian counterpart Mahmoud Ahmadinejad signed a bilateral deal to remove travel visas and attended a Muslim ceremony in the Syrian capital... "We must have understood Clinton wrong because of bad translation or our limited understanding, so we signed the agreement to cancel the visas," Assad said. "I find it strange that they (Americans) talk about Middle East stability and peace and the other beautiful principles and call for two countries to move away from each other," he added. Ahmadinejad told a joint news conference: "Clinton said we should maintain a distance. I say there is no distance between Iran and Syria." He added: "We have the same goals, same interests and same enemies." In the West an attitude towards Palestinian terrorism developed along the lines of "we don't condone the violence but you have to understand the Palestinian grievance." Of course that attitude implicitly excuses the violence it claims not to condone. But this fig leaf (understanding the Palestinian grievance) didn't just excuse Palestinian violence against Israel, it also shielded that Arab world from its openly antisemitic policies (they have to stick up for the Palestinians). "With Allah's help, the new Middle East will be a Middle East without Zionists and imperialists. We hope they will recognize the rights of the region's nations, but they must realize that if they continue along their wrongful path they have no place in our region. Today the ties between the region's nations - between Iran, Syria and the resistance movement - are very strong. We believe that developments in the world will benefit Iran, Syria and the region's free governments," he said. Why is world silent in wake of killing of innocent civilians in Afghanistan? Here are the dry numbers (after all the tears have dried up): Earlier this week, NATO forces hit several vehicles in Afghanistan and killed 27 innocent Afghanis, including four women and a child. And a reminder to those who forgot: A short while ago, 13 other innocent Afghanis were killed after a missile mistakenly targeted a residential home instead of a Taliban position. Let there be no misunderstandings about it: Even though I am writing this thousands of kilometers away from the scene of these incidents, and even though we are talking about anonymous families in a foreign and hostile country, one is pained by the loss of life and by the sudden death of people who wanted to live, love, build a home and plant a tree. In this respect, our tears are real; tears are similar in every corner of the world. But now, after all of the above had been said, we a have a small question; a tiny question, a minor one, something wholly insignificant: Where are you, Goldstone? Here is an unintelligent guess: The world that cries out and weeps for every scratch suffered by a Palestinian child (and we are opposed to even such scratch,) the same world that portrays the State of Israel every morning (in newspapers) and every night (on TV) as the killer and butcher of children and as a state that fires into homes only to find bleeding bodies later on, that world will be silent, or at most offer some lip service in respect to the incident described above. A Palestinian call for comprehensive economic, cultural and academic boycott of Israel was issued in August 2002, a year after the idea was introduced at the first United Nations-sponsored World Conference on Racism in Durban. The "Durban Strategy"— a term coined by NGO-Monitor's Gerald Steinberg—attempts to demonize the Jewish state as apartheid and isolate it with the same boycott and divestment tactics that were used so successfully to dismantle South Africa's apartheid regime. While the comparison of Israel to South Africa is a patently false one rejected by people who have lived and suffered under actual apartheid rule and which has been throughly debunked, it is gaining traction among those who seek an end to the Jewish state. And while the Palestinian-initiated Boycott, Divestment and Sanction (BDS) movement has not managed to inflict economic harm upon Israel, BDS is wielded as a propaganda tool with which to delegitimize that country. One of its few early successes came in 2004 and 2005 through a group of liberal Protestant (or "mainline") churches in the United States that promoted divestment from companies doing business with Israel, although similar anti-Israel resolutions were defeated at subsequent national church gatherings. This campaign was covered in depth by CAMERA's Christian media analyst Dexter Van Zile (see "Mainline American Christian ‘Peacemakers' against Israel") who points out that, "largely because of their shrinking numbers, the churches involved in this campaign have had little impact on the American public's attitudes toward Israel." Over the past year, however, BDS activists have been ratcheting up their efforts. They seized upon the biased and mendacious Goldstone report to endorse their goals, claiming that "the report, and the media attention given to it, moved the terms of international solidarity with Palestine into a new plane, where calling for BDS is no longer considered ‘unrealistic' or ‘counterproductive.'" In its editorial welcoming President Mahmoud Ahmadinejad to Syria, the Syrian government newspaper al-Ba’th makes an interesting point buried at the end. One should note, of course, that this and just about everything else coming out of Syria also makes ridiculous the U.S. policy of engaging the dictatorship there with some illusion of splitting it away from its patron Iran. But there’s something else going on here of the greatest importance. The editorial speaks of people in the Middle East who are coming together in an alliance rejecting Westernization, artificial borders, America, Israel, and various conspiracies. What countries are in this new alliance? Any state that has been complicit in use or abuse of the Australian passport system, let alone for the conduct of an assassination, is treating Australia with contempt and there will therefore be action by the Australian government in response. Clearly, one needs to believe Dubai’s police on the revelations about the forged passports. There is no smoking gun yet about Israel’s responsibility. And hopefully, Israel will keep quiet about this. As Yossi Melman indicates in today’s Haaretz, the investigation is rising to comical levels, even as the evidence against Israel is thin. Look, anyone familiar with James Bond, Jason Bourne, and the Mission Impossible franchise knows that secret agents travel on forged passports. And even assuming Israel is responsible, what did anyone expect — a bunch of Israelis to show up at Dubai airport waving their Israeli passports? Just imagine the conversation. Hussain Abdul Hussain gets it. He’s one of the most interesting Arab journalists and he also writes in English. His latest article—published in the “Huffington Post"—entitled “Lonely Obama vs. Popular Iran” [but you don't have to use the link as I quoted practically all of it] he points out what the most realistic people and more moderate rulers in the Arabic-speaking world are thinking. He explains what I’ve been telling you but since he has “Abdul” in his name perhaps you’ll believe it when he says it. “A common perception is that under President Barack Obama, America's image has improved, and perhaps its friends have increased. But such claims are unfounded, as the opposite proves to be true. The UAE has video of likely assassins. Where's the rest of its film collection? For starters, where's the full surveillance footage of al-Mabhouh himself? He was a killer from way back; a founding member of Hamas's violent Izzedine al-Qassam Brigades, who bragged about his role in the 1989 kidnapping and murder of two Israeli soldiers. The Wall Street Journal, among others, reports that al-Mabhouh at the time of his death "was a key link in smuggling operations ferrying Iranian weapons to Hamas militants in the Gaza Strip." He reportedly arrived in Dubai last month from Damascus, which serves as a haven of hospitality for Hamas' top terrorists. Dubai authorities say he was traveling on a false passport, but apparently they have been able to piece together enough of his trail to inform the press that just before he was murdered, he "met with members of his group and bought a pair of shoes." Please, tell us more--or better yet, show us any accompanying video clips. In whose blood was al-Mabhouh planning to dip those new shoes? Who, exactly, did he meet in Dubai? What for? Did he do any banking in Dubai? How often had he visited before? In recent years have Dubai authorities perchance stored away enough video of al Mabhouh and his terrorist comrades for a full-length feature film? Queried about these matters, the U.A.E. embassy in Washington referred me to the Dubai Police, who did not respond to phone calls or emailed questions. Clearly this is a complex scene. The U.A.E. tries to walk a line between dealing with Iran and its affiliates and cooperating with the U.S. On its Washington embassy Web site, the U.A.E. states that its support for the U.S. includes the hosting of more than 2,000 U.S. military personnel and the contribution of 250 special forces soldiers to the coalition in Afghanistan. Last August Dubai blew the whistle on a shipment of North Korean arms that made a stopover in their waters, en route to Iran. And U.S. authorities in recent times have credited the U.A.E. with starting to crack down on terrorist finance networks. Labels: Dubai, Iran weapon exports, Mahmoud al Mabhouh, U.A.E. Officials of the New Israel Fund (NIF) and of affiliated NGOs have been attacking critics following revelations regarding their contributions to the assault on Israel, particularly in the Goldstone Report. Rather than addressing the severe problems that have been exposed, NIF and its supporters have targeted NGO Monitor with hysterical attacks and irrational mudslinging. Defenders of NIF, such as Gershon Baskin (“A dark day for democracy,” Feb. 8, 2010) and David Newman (“The politics of delegitimization,” Feb. 9, 2010), as well as NGO officials (Mitchell Plitnick of B’Tselem, Hagai El-ad of the Association for Civil Rights in Israel, Yossi Alpher of Peace Now, and others), have painted an image that puts NGO Monitor’s research at the center of a vast right-wing conspiracy and “witch hunt” intent on sabotaging democracy and blocking free speech through “McCarthyite” tactics. While it is tempting throw some mud back, I will refrain. It is more constructive to provide an alternative to the hysteria used by both political fringes. I have known Baskin, Newman, Alpher, and NIF President Naomi Chazan for many years, and while I believe their self-interests and narrow ideologies blind them to reality, they are committed Zionists who believe in the importance of Jewish national self-determination. Why, then, are these Zionists contributing to the war against Israel, using the strategies adopted in the infamous NGO Forum of the 2001 Durban Conference and embodied in the Goldstone process? How can we explain their roles in “apartheid” propaganda and exploitation of the language of international law and human rights to demonize Israel? I’m still thinking about the phenomenon of left-wing anti-Zionist Jews. Let’s skip the doctrinaire Marxists stuck in their closed system like Noam Chomsky, the opportunists like Jeremy Ben-Ami, the mentally unbalanced like Norman Finklestein and those obsessed by hatred like Philip Weiss (note that some of the above fall into more than one category). Let’s talk about the non-pathological ones who have nevertheless come to think that the existence of a Jewish state is fundamentally unjust. Sometimes they even say that Jewish ethics precludes Zionism. A good example is Rabbi Brant Rosen. A reconstructionist rabbi, he calls himself a member of the “co-existence community.” This sounds like a good thing; Jews and Arabs should co-exist. But Rosen’s approach turns out to be one-sided. Obviously there are some serious historical issues buried here. ‘Indigenous’ carries a lot of freight. Were Arabs who came to Ottoman Palestine in the 1830’s from Egypt with Muhammed Ali so much more ‘indigenous’ than the Zionists of the 1890’s? What about Arabs who arrived after the turn of the 20th century to take advantage of economic development fertilized by Jews? What about the Jews who had been in ‘Palestine’ since the exit of the crusaders? On the morning of the eleventh of Adar 5680 (March 1st 1920), a mob of several hundred Arab raiders made their first attack on Tel Chai. "What is a pioneer? Is he a worker only? No! The definition includes much more. The pioneers should be workers but that is not all. We shall need people who will be “everything” – everything that Eretz Yisrael needs. A worker has his labor interests, a soldier his “esprit de corps”, a doctor and an engineer, their special inclinations. A generation of iron-men; iron from which you can forge everything the national machinery needs. You need a wheel? Here I am. A nail, a screw, a block? – here take me. You need a man to till the soil? – I’m ready. A soldier? I am here. Policeman, doctor, lawyer, artist, teacher, water carrier? Here I am. I have no form. I have no psychology. I have no personal feeling, no name. I am a servant of Zion. Ready to do everything, not bound to do anything. I have only one aim – creation." Throughout Israel’s history, from the time of Avraham until today, there has been one single phrase that has consistently expressed the willingness to accept responsibility and work towards the collective good. Hineini – “here I am” – has forever been the watchword of readiness to answer a call. Rabbi Avraham Yitzhak HaKohen Kook writes in Musar Avicha that the words hineini use the language of modesty and hastened enthusiasm. It is an expression that connotes total readiness to carry out the will of the caller. A person who says hineini is not only prepared to complete a task, he approaches it with a zealous enthusiasm. Whether in response to a prophetic calling from G-D or to one deep in a man’s own conscience, hineini forever symbolizes selfless and heroic dedication on behalf of Israel’s collective destiny. Not every person can truly say hineini. The statement alone is a great sacrifice because it automatically opens one up to a higher calling. A person who feels hineini is one who, deep in his soul, is idealistically charged to complete an essential task. For most it is impractical as it takes people away from their personal aspirations. In today’s cynical world, people often calculate interests rather than answer Divine calls. But there was one man – a symbol of courage – in Israel’s recent history that made hineini his trademark and lived up to its connotation. He always heard the call of Israel’s needs and valiantly rose to the challenge of easing the national burden. Introduction: International organizations declared Thursday, February 25, 2010 as 'Open Shuhada Street Day.' Shuhada, in Arabic, means martyr. This is, according to the Arabs, a road named in memory of 'martyrs' who have murdered Jews. 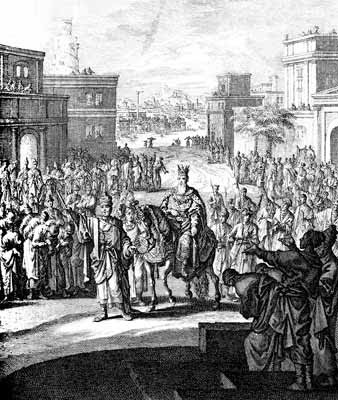 The street's real name is King David Street, in honor of King David, who began his monarchy, the Kingdom of Judea, and later the Kingdom of Israel, in Hebron, over 3,000 years ago. Parts of this road have been closed to Arab traffic for security reasons. Gadi and Dina Levy were murdered on this road by a homicide bomber. Aharon Gross was stabbed to death on this road. Sixteen year old Eliya Meshulam was stabbed and critically wounded on the road. Six men were killed and twenty others wounded on the road in a major terror attack on this road. Two retired men were stabbed by an Arab terrorist on the road. Three young men had acid thrown at them on this road. Others were attacked, but escaped injury. Although H2 is a relatively small portion of the city, it is Hebron's true city centre where the industrial and commercial zones, as well as the most important landmarks, are located. H2 is an important passageway between the northern and southern parts of the city. Therefore, restricting movement in H2 significantly affects the freedom of movement of all residents of Hebron. Concerning the city center: As can be seen above, Hebron city center is certainly not in H2. Arab Hebron is a large, thriving city, with continued construction, factories, businesses, markets, and all elements of metropolitan life. This area, much larger than H2, is certainly more conducive to businesses and markets; therefore the claim that H2 is actually the city center is false. Concerning access to all areas of Hebron, Hebron's Arab population has access to over 98% of the city. All areas can be accessed without any major issues. It would seem that there would be more discussion of the deeds of such people so they are not portrayed, at least implicitly, as innocent victims. Readers could weigh the assassination against their crimes, which would otherwise go unhindered and unpunished. Mabhouh was probably in Dubai arranging more arms' shipments from Iran so that Hamas could go to war again, causing deaths on both sides. He was a real war criminal, in contrast to the bogus ones fabricated by the terrorist-sponsoring dictatorships which seem to have so much influence on the "human rights" agenda. 2. As long as Western states do nothing to help bring Hamas or Hizballah terrorists to justice, and since Israel has no way of getting these people before a court, it has no option other than the extra-judicial one. Remember that an Israeli cabinet minister is more likely to face prosecution in the United Kingdom nowadays than a terrorist who has murdered Israeli civilians. Boston Globe columnist James Carroll has done it again. On February 22, 2010, he penned another highly biased opinion piece about Israel, relying heavily on personal claims leveled by Palestinians. The topic is evictions of several Palestinian families from disputed property in eastern Jerusalem. The writer promotes falsehoods about the disposition of the property and trashes Israeli legal proceedings that preceded the evictions. Beyond misrepresenting the facts and history of the case, Carroll offers a skewed portrayal of the two sides. Though he's written forthrightly and eloquently (in Constantine's Sword: The Church and the Jews) about the history of Christian hostility towards Jews, he has long seemed unable to apply the same approach to Israel. The February 22 commentary about supposed "creeping annexation" of Arab land echoes recent similar bias and error about Jerusalem. The column focuses on the eviction of Palestinian families in the Sheikh Jarrah neighborhood of Jerusalem. Carroll describes the land on which the homes were built for the Palestinian families in the 1950s as "vacant," obscuring a crucial element of this story. The land had been purchased by two Jewish organizations in the late 1800s, but was siezed by the Jordanians during the 1948 war. Regrettably, Carroll, who once wrote of being troubled that a clock owned by his mother in Germany might have previously been stolen from Jews, does not reflect on how the Arab families he champions were similarly the beneficiaries of violent dispossession of property from Jewish owners. He dismisses out of hand the history of Jewish ownership while giving voice in detail to the claim by the Arab occupants that their failure to secure the property deed was due to the 1967 war in which Israel took control of the land. The 700 word piece also never mentions the salient fact that even after Jewish claims of ownership were confirmed, the evictions only came about because the Arab families stopped paying rent. Last week, BBC Radio 4 broadcast an interview in which it was stated that between 500,000 and one million Jews around the world are available to facilitate assassinations committed by the Israeli spy agency Mossad. This story has already been covered by a number of blogs (starting with Judeosphere). I had an opportunity to listen to the interview today and found that, although the BBC has claimed that this bizarre conspiracy theory came at the end of the broadcast and so could not be rebutted, the entire interview is a shocking series of absurd assertions concerning information the guest claims to have learned directly from anonymous Mossad agents. The interviewee, an author named Gordon Thomas, starts by stating that the assassination of Mahmoud al-Mabhouh had "all the hallmarks of a Mossad operation". He then attempts to list these hallmarks, but names only one: that al-Mabhouh was killed in a hotel bedroom, and Mossad assassins are "trained in that very tactic". By this standard, any killing in a hotel bedroom could be blamed on the Mossad. The claim that this means the killing had "all the hallmarks" is quite a leap. A basic principle is to look at the underlying interests and perceptions of specific governments, not the immediate headlines. Over and over we see stories that prove false in a few days yet probably leave a lasting impression to the contrary on readers. That thought is prompted by a recent flurry of stories that the Palestinian Authority is about to return to negotiations with Israel. In fact, for reasons I’ve outlined repeatedly in this blog (relating mainly to the radical nature of internal Palestinian politics) that isn’t going to happen for a long time. Another story we keep hearing is about how Russia or China are about to support real sanctions on Iran. Yet every time an official from those countries makes a statement it is to the contrary. On February 18, 2010, the Iranian website Asr-e Iran posted an editorial stating that Iran's possessing nuclear weapons will threaten Israel's existence and lead to its elimination – even if they are never used. The editorial explained that Israel's raison d'être is the illusion that it can provide absolute security for the Jewish people, and that it has security supremacy. Once Iran possesses nuclear weapons and shifts the balance of power in the Middle East, it states, this will be end of Israeli society. "The Zionist Regime Must Continue to Preserve this Illusion of 'Absolute Security' within the Borders of Israel"
"In order to continue to be a safe haven for Jews from all over the world, and to continue to draw human, economic, and other capital from all over the world, the Zionist regime must continue to preserve this illusion of 'absolute security' within the borders of Israel (i.e. occupied Palestine). "For this reason, and driven by this strategy, in the 1960s Israel produced dozens of nuclear warheads (as the Western countries looked the other way, and some even collaborated, such as France) – so that it would, or so it thought, attain absolute supremacy in the Middle East balance of power. "The truth is that for Israel, not just insecurity, but even the mere sense of insecurity is deadly poison. That is why this regime focuses all its efforts on preventing what it sees as the nuclearization of Iran. "Israeli officials are well aware of what nuclear weapons mean and of the scope of their deterrence. They know well that using nuclear weapons as deterrence in a first strike capacity means mutual destruction if the other side has them as well. Thus, it cannot be assumed that a country that has nuclear weapons will use them against another country (particularly if that country also has them). A mother of five was having trouble with one of her children. “My kids help clean up every day after lunch,” said A, whose story appears on the Internet site of Merkaz Shefer, a women’s forum that has developed a new approach to child rearing. “Someone sweeps the floor, someone clears and wipes the table. “The difficult job is washing dishes. For a while, one of my children – the five-year-old – refused to do it. I tried everything. I got angry, I threatened, I punished, but no matter what I did nothing worked. “But after taking part in Merkaz Shefer’s parent guidance course, I learned that deep down every child really wants to cooperate around the house. I just needed to be convinced that there was nothing my children wanted more than to help out. “When I made the switch in outlook – without punishment, prizes, unnecessary talk – things changed. 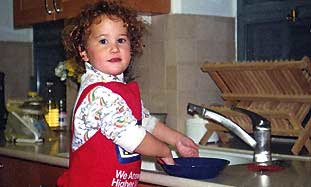 “Now my five-year-old usually washes the dishes. Occasionally, when he doesn’t want to, I wash dishes – not because I caved in to him but because I want clean dishes. Merkaz Shefer, established this summer, is a group of about 70 women, the vast majority religious, who have articulated a new approach to child rearing. Using a philosophy based on the psychological theories of Alfred Adler and borrowing from traditional Jewish sources, they aim to fight what they see as a worrisome trend in the Western world that is producing spoiled, maladjusted children who are unable to cope with the challenges of being adults. As Alan Dershowitz is wont to do, he takes a lawyerly look at whether the killing of Hamas military leader Mahmoud al-Mabhouh in a Dubai hotel room was legally and morally justified. He assumes, for the sake of argument, of course, that Mossad “did make the hit.” On the legal side, he notes that there are certainly extrajudicial killings that are not unlawful. “Every soldier who kills an enemy combatant engages in an extrajudicial killing, as does every policeman who shoots a fleeing felon.” After some analysis, he concludes: “This was not an ordinary murder. It was carried out as a matter of state policy as part of an ongoing war. … Obviously it would have been better if he could have been captured and subjected to judicial justice. But it was impossible to capture him, especially when he was in Dubai.” Well, the “obviously” is debatable, but his conclusion is sound. The Goldstone Report ordered by the UN Human Rights Council suggests that Israel cannot lawfully fight Hamas rockets by wholesale air attacks. 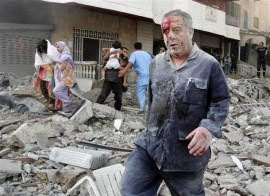 Richard Goldstone, in interviews, has suggested that Israel should protect itself from these unlawful attacks by more proportionate retail measures, such as commando raids and targeted killing of terrorists. Well, there could be no better example of a proportionate and focused attack on a combatant who was deeply involved in the rocket attacks on Israel, than the killing of Mabhouh. Not only was he the commander in charge of Hamas’ unlawful military actions, he was also personally responsible for the kidnapping and murder of two Israeli soldiers several years earlier. It’s hard not to see the unalloyed benefit in the surgical assassination of Mabhouh, unless, of course, the applicable moral rule in these situations is that Israel is never entitled to defend itself. On Monday evening, Israel’s parliament, the Knesset, quietly passed a bill that could change the Middle East agenda forever. Up to a million Jews were forced to leave Arab countries and Iran in the decades following the foundation of the State of Israel in 1948, due to state-sanctioned persecution and violence. Today only some 4,000 Jews are left in the Arab world, bringing to an end a Jewish presence that in many cases pre-dated Islam and the Arab conquest by 1,000 years. The bill has taken two years, since its initiation by MK Nissim Ze’ev of the Sephardi Orthodox Shas party, to become law. The new law aims to protect the rights of Jewish refugees from Arab countries and Iran in future peace negotiations in the Middle East. The bill defines a Jewish refugee as an Israeli citizen who left one of the Arab states, or Iran, following religious persecution. It stipulates that the Israeli government must include Jewish refugee rights, notably compensation, in all future peace talks. Stanley Urman, the head of the advocacy group Justice for Jews from Arab Countries, welcomed the Knesset decision, saying: “The world must realise that Palestinians were not the only Middle East refugees; that there were Jewish refugees who also have rights under international law. This recognition is good for the State of Israel and it is good for the people of Israel." Why is this bill so important? Because it holds the key to real peace in the Middle East. So many efforts at making peace between Israel and the Palestinians have run aground on the rock of the Palestinian ‘right of return’. Not content with a Palestinian Arab state in the West Bank and Gaza, even the ‘moderates’ of the Fatah camp have been reluctant to recognise Israel as a Jewish state. The reason is that they are unwilling to drop their demand for the Arab refugees of 1948 – who now number upwards of four million if you include their descendants - to return to their homes in what is now Israel. This demand amounts to no less than the destruction of Israel by demographic means and the de facto creation of two Palestinian states, one in the West Bank, and one in place of Israel. After the hijacking of the Achille Lauro in 1985, the United States attempted to capture the terrorist responsible by forcing the plane they were on to land on an American-Italian base in Sicily. However, Italy and Egypt were outraged and Italy refused to extradite the terrorists. Jack Ohman the cartoonist for the Oregonian brillaintly captured the hypocrisy of the anger directed at the Reagan administration for trying to bring the killers to justice. His cartoon showed pictures of Hosni Mubarak, Bettino Craxi and Yasser Arafat; under each picture there was a caption: "Mr. Mubarak demands an apology"; "Mr. Craxi demands an apology"; "Mr. Arafat demands an apology." On the right of the panel was a wheelchair draped with an American flag. The caption was "Mr. Klinghoffer has no demands." For the all the outrage the three politicians expressed, there was no remorse that they had played a role in allowing terrorists to kill or escape. Things have not changed much. Arab terrorists still threaten Israel with the acquiescence of Arab states and European countries still enable them. The use of forged European passports by assassins who entered Dubai and killed a Hamas operative may lead the United Arab Emirates to review the open border policies that have made it a commercial and tourist hub, a top UAE official said Sunday. On February 14th, all of the major Palestinian terrorist factions met at the offices of the Popular Front for the Liberation of Palestine (PFLP) for peace talks. But this was not about peace with the Israelis. No, this was a meeting to reconcile differences, in order to direct all energies in a violent manner against Israel. While the West has been obsessed with locating a “peace partner” for the Jewish state, none would be found here. The Palestinian people, for the most part, can be divided into two camps: one, a religious terrorist camp and two, a secular/nationalist terrorist camp. Members of Palestinian society usually side with one or the other, whether it’s through politics, community affairs or violence. There is little grey area, in this respect. The religious terrorist camp is made up of organizations which spawned from the Muslim Brotherhood (MB), al-Ikhwan al-Muslimun, a group created in the 1920s that merged fundamentalist Islam with an extremist political agenda. Palestinian organizations that fit into this category include Hamas and Palestinian Islamic Jihad (PIJ). PIJ, while deriving its existence from the Brotherhood, however, was established in 1979 with a greater attachment to the more violent methods of the Iranian Revolution of the same year. The secular terrorist camp consists of groups that fall under the umbrella of the Palestine Liberation Organization (PLO). The two main groups that make up the PLO are the Palestinian National Liberation Movement or Fatah and the Popular Front for the Liberation of Palestine (PFLP). 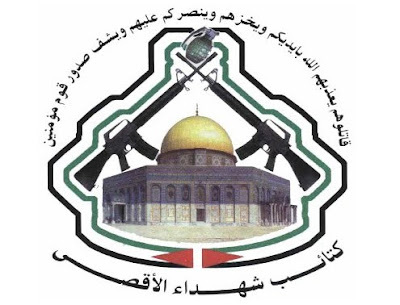 Unlike Fatah, though, which uses some Islamic imagery, the PFLP operates solely as a Marxist-Leninist organization. But according to the PFLP, this was less about restoring unity among the Palestinian groups and more about fighting Israel as a unified force. The Jerusalem Post has published a series of articles relaying accusations by the former head of the Palestinian Authority’s anti-corruption department, Fahmi Shabaneh, that close associates of Palestinian President Mahmoud Abbas engaged in embezzlement, land theft and fraud. According to Post correspondent Khalid Abu Toameh, Shabaneh possesses numerous documents exposing the theft of government money, much of which comes from foreign donations. decided to talk to the Post after Palestinian, Arab and foreign media organizations refused to interview him out of fear of being "punished" by the PA. Shabaneh explained further, "Al-Jazeera and other Arab media outlets told me that they are afraid to publish anything that angers the Palestinian Authority." Shabaneh said that even some foreign journalists based in the country had refused to publish his statements, citing various pretexts, including fear of retribution by the PA.
"Some of the foreign journalists don’t want to hear negative things about Fatah and Abbas," he said. "That’s why they didn’t want to cooperate with me and why I decided to go to the Post." Even after the story broke on Jan. 29, 2010, there was nearly total silence about Shabaneh’s accusations. A search of major publications indicates the National Post of Canada was the only western print media to cover the story for nearly two weeks after the Jerusalem Post published the revelations. The son of a leading Hamas figure, who famously converted to Christianity, served for over a decade as the Shin Bet security service's most valuable source in the militant organization's leadership, Haaretz has learned. 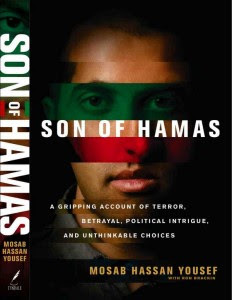 The exclusive story will appear in this Friday's Haaretz Magazine, and Yousef's memoir, "Son of Hamas" (written with Ron Brackin) will be released next week in the United States. Yousef, 32, became a devout Christian 10 years ago and now lives in California after fleeing the West Bank in 2007 and going public with his conversion. 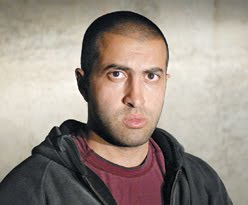 Yousef was considered the Shin Bet's most reliable source in the Hamas leadership, earning himself the nickname "the Green Prince" - using the color of the Islamist group's flag, and "prince" because of his pedigree as the son of one of the movement's founders. During the second intifada, intelligence Yousef supplied led to the arrests of a number of high-ranking Palestinian figures responsible for planning deadly suicide bombings. These included Ibrahim Hamid (a Hamas military commander in the West Bank, Marwan Barghouti (founder of the Fatah-linked Tanzim militia) and Abdullah Barghouti (a Hamas bomb-maker with no close relation to the Fatah figure). Yousef was also responsible for thwarting Israel's plan to assassinate his father. Can We Defeat Terrorists without Defeating Terrorism? “We are not waging a war against terrorism because terrorism is but a tactic that will never be defeated, any more than a tactics of war will. Rather, such thinking is a recipe for endless conflict. ... We are at war with Al Qaeda and its extremist allies, and any comment to the contrary is just inaccurate." Now there's an obvious paradox in a man whose own post is defined by counterterrorism, arguing that terrorism can never be defeated. Back when the USSR forged its pact with Nazi Germany, the Soviet propaganda machine propounded that they were not at war with "fascism", as "isms" could not be defeated. Similar defeatist arguments were used by Western governments to argue that Communism was another "ism" and Isms could not be defeated. Both arguments were of course proven wrong, because you can defeat an "Ism" by bringing down the system and country that most exemplifies it, thereby devaluing it as a political or ideological strategy at least for some time to come. That in turn is exactly why Muslim terrorism is targeting America, because we exemplify a society that blends human freedoms, popular representation and free enterprise. If they can corrupt, destroy or bring down America, they will have come one step closer to demonstrating that there is no alternative to accepting Islam. Brennan argues that terrorism is just another tactic of war, and that therefore it cannot be defeated. This is wrong on both counts, as a man who spent so much time in the intelligence and counterterrorism world should know. First of all a tactic of war can indeed be defeated by demonstrating that its use is either futile or self-destructive. The reason we have never had a nuclear war, is because any strategy that depended on winning a nuclear war was eliminated by demonstrating that it was far more likely to lead to self-destruction, than to victory. Secondly terrorism is not a tactic of war, it is a political tactic. Terrorists don't employ terrorism in order to defeat armies, but to show that the army and security forces are unable to defeat them or stop their attacks. Their real target is the political apparatus of the enemy which is forced to make concessions to the political goals of the terrorists in order to end the attacks. These concessions can be direct or indirect. An example of direct concessions would occur at a peace conference, such as the Oslo Accords signed between Israel and Arafat. While an indirect example would be the American and European attempt to appease "moderate" Muslims who have the same goals as the "extremist" Muslims . While the terrorists will usually denounce such appeasement, this is only done in order to stake out their position on the left or the right, and thereby achieve even more far ranging concessions.